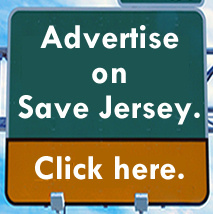 It’s one thing for agencies and departments under the executive branch’s purview to enact the governor’s policies, Save Jerseyans. That’s generally uncontroversial! It’s another thing altogether for civil servants to spend their time (and our money!!) BOOSTING the governor’s political priorities. Exhibit A: Using the Attorney General’s office as a political tool to combat (and specifically file/join an endless array of new lawsuits against) the Trump Administration, something that’s been written about/discussed here and elsewhere. 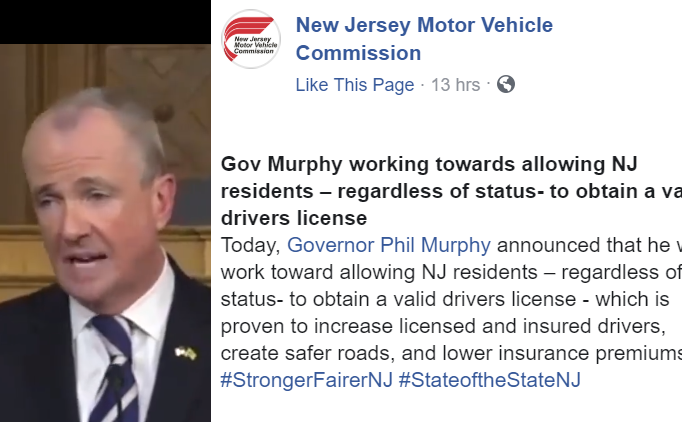 Exhibit B: Now the Motor Vehicle Commission (MVC) is being used to promote a Murphy-backed legislative push (for illegal alien driver’s licenses) which hasn’t even cleared the legislature as of this writing. 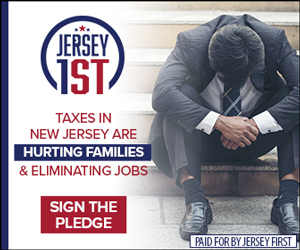 “Today, Governor Phil Murphy announced that he will work toward allowing NJ residents – regardless of status- to obtain a valid drivers license – which is proven to increase licensed and insured drivers, create safer roads, and lower insurance premiums,” the MVC page proclaimed, adding the hashtags “#StrongerFairerNJ #StateoftheStateNJ” for good measure. A politicized MVC is an objectively troubling development, folks. It really, truly is, and it began with the Democrat decision to turn the MVC’s stations and offices into automatic voter registration mills. 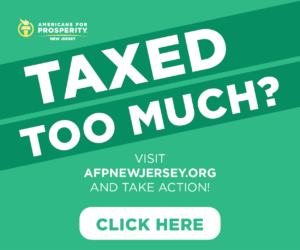 The Governor is using OUR money — in the form of the institutions and public employees on the government’s payroll — to CAMPAIGN for his radical agenda… not simply enact those policies when ratified by the legislature or the voters at the polls. It’s obscene. Highly inappropriate. Dangerous. What’s next? Department of Community Affairs tweets advocating higher property taxes? Can the “Dear Leader” banners hanging on city walls and lamp posts be far behind? Campaigning bureaucracies are a hallmark of dictatorial regimes around the globe and throughout time; it’s also the exact sort of undemocratic nonsense which, indirectly, the Janus majority struck out against.